Phlegm is a British Sheffield-based muralist and artist who first developed his illustrations in self-published comics. The name ‘Phlegm’ came from one of the four temperaments in ancient Greek medicine; blood, yellow bile, black bile, and phlegm. Phlegm was believed to be responsible for an apathetic and unemotional temperament. 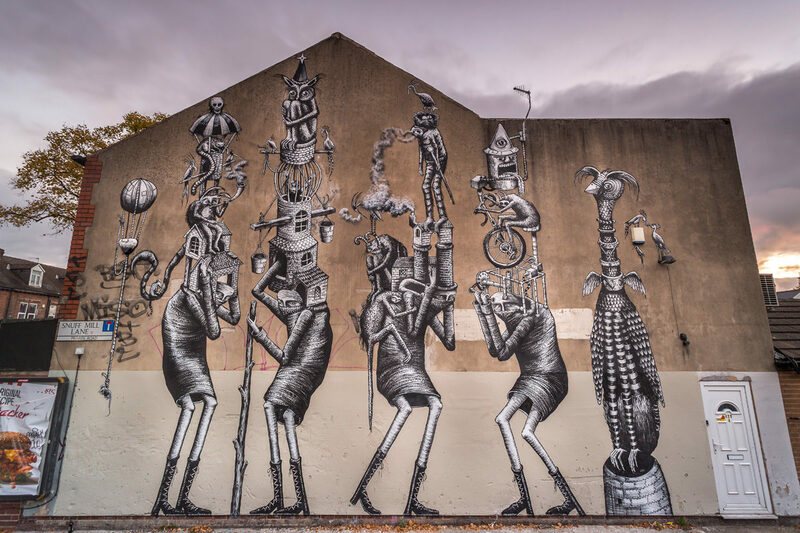 Phlegm’s work features in the urban landscape, and can mostly be seen in run-down and disused spaces. Phlegm creates surreal illustrations to an untold story, weaving a visual narrative that explores the unreal through creatures from his imagination. Phlegm’s storybook-like imagery is half childlike, half menacing, set in built up cityscapes with castles, turrets and winding stairways. At other times the city itself is the setting for his long limbed half-human, half-woodland creatures. In this dream world a viewer comes across impossible flying machines and complex networks of levers, pulleys and cogs, set beside telescopes, magnifying glasses and zephyrs. Working solely in monochrome, his fine technique and intricate detail can be seen as a curiosity cabinet of the mind. Each drawing forms part of a grand narrative that extends worldwide, in countries including Norway, Canada, Switzerland, Sri Lanka, USA, Belgium, Poland, Italy, Slovakia, Spain and Australia. His work has also appeared in a variety of objects such as airplanes, boats, buildings, vehicles and many street art festivals.